Our Simple® Eye Make-Up Remover removes even waterproof mascara and soothes the delicate eye area. A beauty must have for makeup lovers, our eye makeup remover is gentle on your eye area. Made with the perfect blend of skin loving ingredients and added Pro-Vitamin B5, its gentle yet effective. Like all our Simple® product, our eye makeup remover is dermatologically tested and approved. A face makeup remover for the eyes with no harsh rubbing needed and no stinging on the eyes. Specially formulated to be kind to eyes and all sensitive skin types. 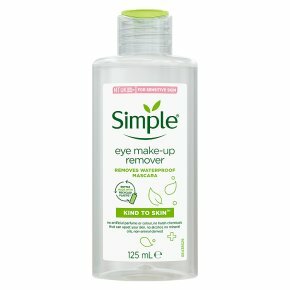 Simple® Kind to Skin Eye Make Up Remover cleanses effectively yet is gentle around the delicate eye area. The oil-free formulation of our gentle Eye Make Up Remover, removes even waterproof mascara and soothes the delicate eye area. The skin around your eyes is the most delicate and with our Simple Eye make Up Remover it?s a gentle makeup remover for even the most sensitive skin. Our Eye Make Up Remover is an effective mascara remover and the perfect blend of our purest possible sensitive skin loving ingredients with added vitamins. Our Simple Eye Make Up Remover contains no artificial perfume or colour and no harsh chemicals that can upset your sensitive skin. Like all our Simple makeup remover products, our eye Make-Up remover is dermatologically tested and approved. So whether you?re wearing makeup day or night, there is no harsh rubbing needed and no stinging on the eyes, so it?s a great mascara remover. It?s also suitable for sensitive eyes and sensitive skin for contact lens wearers. A must-have for any make up bag and an essential for anyone who loves to wear eye makeup. For best results and how to apply: Step 1: Apply Simple makeup remover to a cotton pad or eye pads. Step 2: Wipe gently around your eye without rubbing. Warning. Avoid getting into your eyes. If it gets into your eyes, rinse thoroughly with water. Make sure to try our other eye care products such as our eye roll on, eye cream, eye balm and make up removing eye pads!